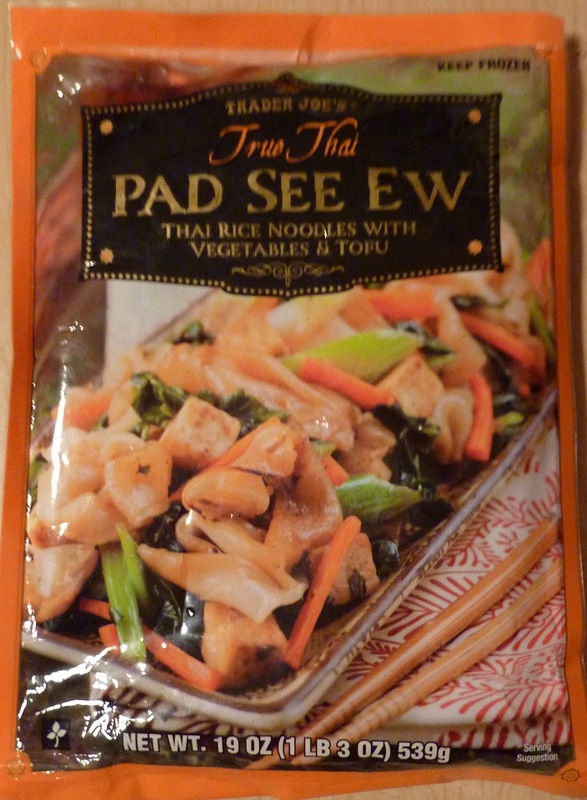 Back in March 2011, we reviewed Trader Joe's relatively unsuccessful, unappetizing Vegetable Pad Thai. Curiously, three months later, we noticed a sudden uptick in clicks on that particular post. We couldn't figure out where they were coming from. Our analytics weren't showing any new traffic sources. 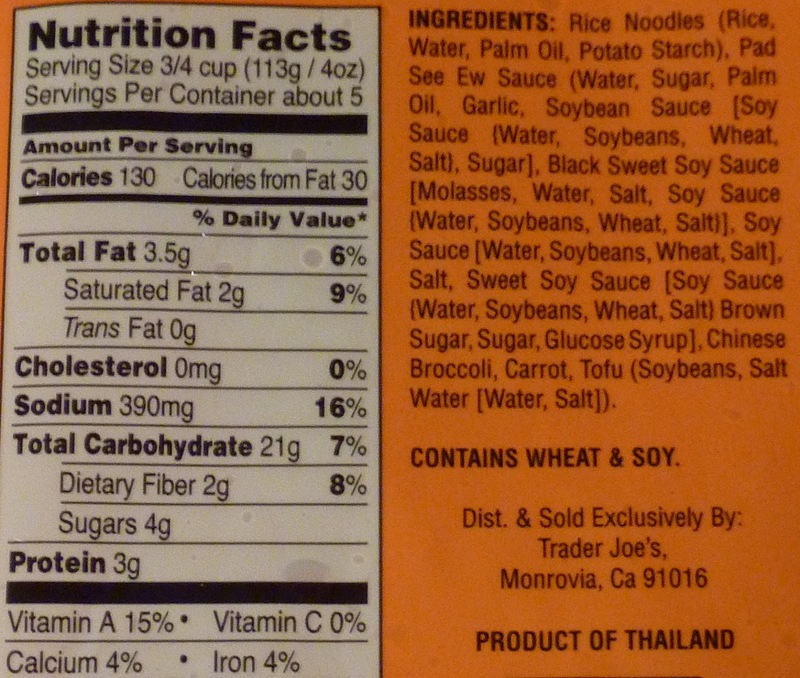 But after a bit of searching, we noticed people were Googling "Trader Joe's Vegetable Pad Thai" in huge numbers. So we Googled that phrase ourselves. Apparently the entire New York metro area had been enraptured by a court case involving an opera singer and a prestigious women's health doctor and a violent disagreement over the last box of veggie pad thai at an Upper West Side Trader Joe's. Of course, the biggest mystery in all of this is: of all the delicious TJ's products you might get into a cat fight over, why ever would it be that forgettable pad thai? 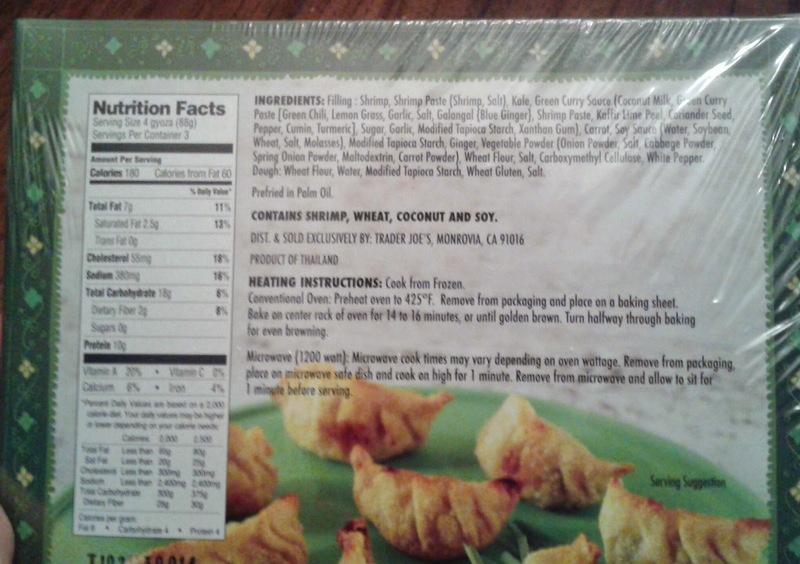 But anyway, the point is that the comments section on the aforementioned pad thai review turned into a mini-discussion about this product: Trader Joe's True Thai Pad See Ew. Comments from readers in regards to this product: "truly disgusting," "put the 'Ew' in 'Pad See 'Ew'," "I wouldn't wish this dish on anyone," and "one of the worst things I've ever picked up from TJ's." We've even had negative comments about it on our Facebook page. In fact, I've never heard anything good about it. Which is why we finally had to try it. Although I don't disagree with the people who find this dish revolting, it's not SO bad, in my opinion, that I ever considered NOT clearing my plate. At no point did I seriously think about taking the unused portion back to TJ's and getting a refund, although, this will never be purchased in our home again, unless TJ's manages to repackage it, rename it, and trick us into thinking it's a new product entirely—which I certainly wouldn't put past them. Sonia described the vegetables as "slimy and chewy." The Chinese broccoli, in particular, was stringy. The noodles were way too soft—almost gelatinous. The tofu didn't blend in with the rest of the product, and the carrots seemed too firm. In its defense, the product's flavor wasn't a complete failure. The tofu by itself tasted fine. The vegetables were fairly neutral, flavor-wise. The sauce might have been the best part. It was mildly garlicky and salty—but ultimately, it wasn't flavorful enough. It tried valiantly to rescue this doomed dish, but still failed in the end. I doubt even General Tsao's Stir Fry Sauce could have pulled this mess together. 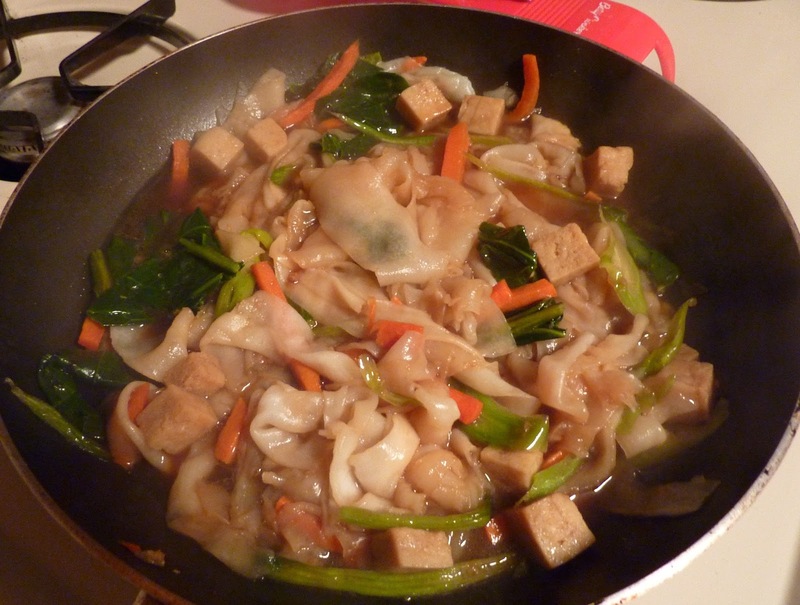 And even if the flavor had been pleasant, the troublesome texture of this pad see ew was most definitely its Achilles' heel. 2 stars from me. 1.5 stars from Sonia. Bottom line: 3.5 out of 10. You readers are so smart. S-m-r-t. No, seriously. 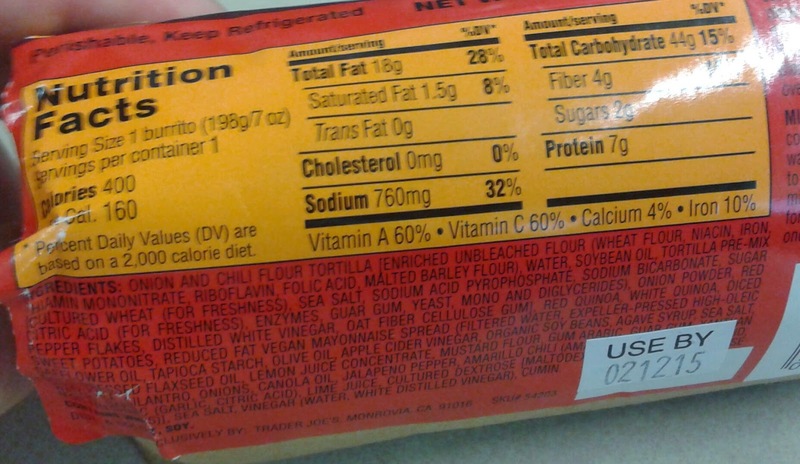 I'm going to pick up just a recent example: The one who pointed out that the "enzymes" in Trader Joe's Super Burrito! probably included L-Cysteine, which is from animal sources and -gulp- can be derived from human hair -ewwww - therefore not making the burrito a vegetarian or vegan product, despite it going out of the way to include vegan mayo. That's an unsettling sentence for me to type. Yuck. Now every time I see the word "enzymes" on an ingredient list I'm going to think of the first half of this Family Guy scene. Here's a cheerier example: A couple weeks back I reviewed those Thai Shrimp Gyoza, thinking there were some new hot item, and being pretty disappointed in their lack of taste and flair. 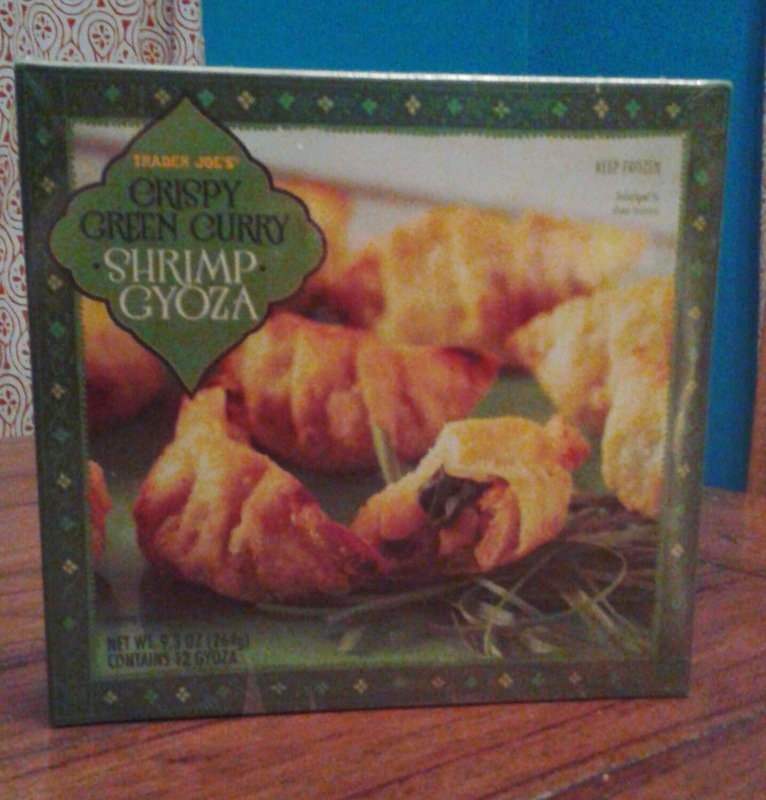 Another one of you was pretty quick to point out that I probably really had these Trader Joe's Crispy Green Curry Shrimp Gyoza in mind, and a quick consultation of the "What's New" shelf and display at the store and even quicker comparison of package colors (green vs. yellow) showed that yes, once again, you all are right. Thanks as always! And these gyoza are absolutely what I wanted when I got those other ones. Like Cher, if I could turn back time...These are the real deal. There's very little to not like about these crispy dumplin's. First, the wrapper. Even though we just baked these (as is even the preferred prep method, you can also microwave, but why? 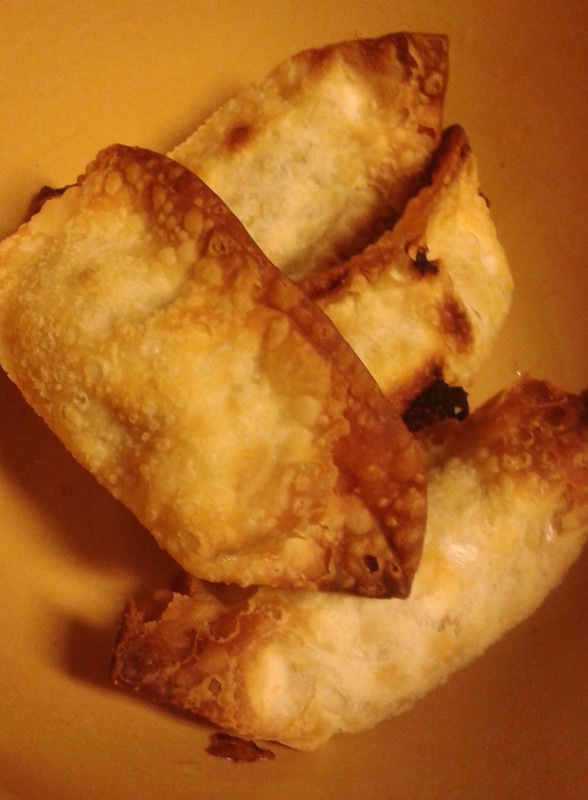 ), the wonton wrapper got very crispy despite its thinness, while still holding the innards and stuffing all together with very few leakages. It was rather impressive, actually, and although my waistline likes the fact we didn't deep fry them, well, my tongue would have loved to tried. Must be that palm oil they're pre-cooked in...ohh..I'll let that slide, yet again. I know, I know. It's not just the outside that lived up to the "crispy" billing. The insides were too. Oh, no, it wasn't the shrimp - that was yet another example of superior TJ firm, fresh, nongritty, nonsalty, yummy shrimp. Didn't even notice the "shrimp paste" unlike previous times. Nope, it was the veggies in there too, which were predominantly carrots and kale. Those too were fresh and firm, with a little crunch, offering a great mouthfeel-y counterbalance. And then there were all the great flavors that Thai food can offer, especially in curries - the sweet coconut, the bite of some lime, the heat off some spices. They may err slightly on the spicy side, so if you prefer milder, these may be a little strong. The only real complaint that either Sandy or I had was we would have loved an included packet of dipping sauce. Just a little extra somethin'-somethin' to dunk these gyoza in would have been an absolute killer, and given that my choices on hand were Frank's Red Hot or my new favorite BBQ sauce, I think we might the right decision to forgo any condiments. Something like a currylicious dipping sauce, though? Man, my mouth waters. In our minds, this is a tremendous pick-up for the roughly four bucks for a spicy seafood pick-me-up that approaches restaurant quality for a fraction of the price. Matching fours. 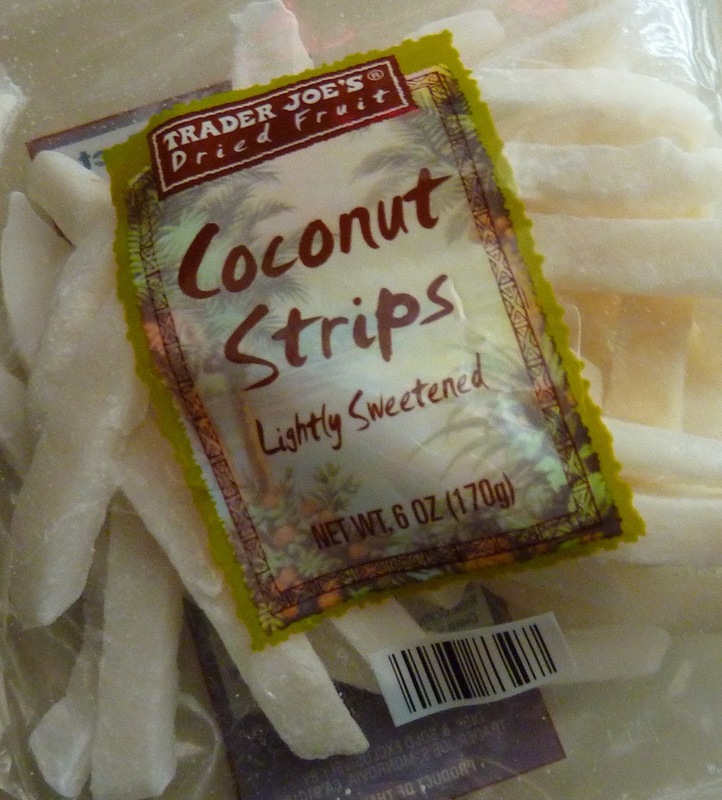 In their tradition of excellent coconut products like Pancakes, Creamer, and Cooking Spray, Trader Joe's has offered us an inexpensive bag of snackable little sticks...er, strips. They're very similar to the "Coconut Chips" we checked out long ago, and they taste about the same too, except these puppies are thicker, firmer, and a tad more chewy. In fact, they're surprisingly tough in my opinion, and for that reason, I think the chips were a superior product. Sonia disagrees, stating that these slivers remind her a lot of sugar candy, but slightly more healthy. There are only three ingredients, the first two being coconut and cane sugar. So far, so good. 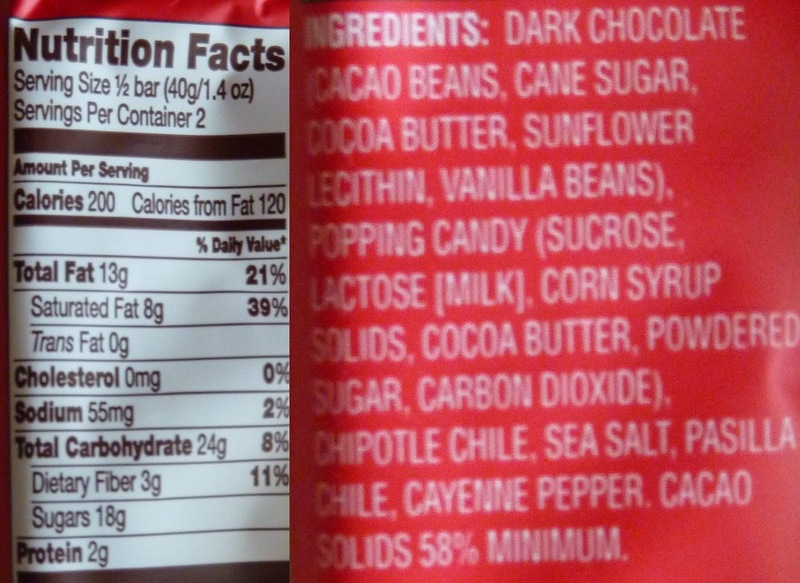 But that third and final ingredient, sulfur dioxide, prompted a little Google research. I found statements ranging from "It's harmless" to "It will kill you" and everything in between. The general consensus, though, seemed to be "It depends on the dosage," which isn't particularly comforting, considering we don't really know the exact dosage we're getting in a small bag of coconut strips. I'm going to go ahead and assume there are only trace amounts of it present, because (A) I'm an optimist and (B) I'm still alive. Apparently, they need this delicious-sounding sulfur dioxide to keep the product fresh, as it is shipped all the way from Thailand. Not exactly "going local," but that's a whole 'nother can of worms... Just think of it like this: you're getting a sweet, exotic snack from half way around the world for less than $2. There's that characteristic optimism of mine again. 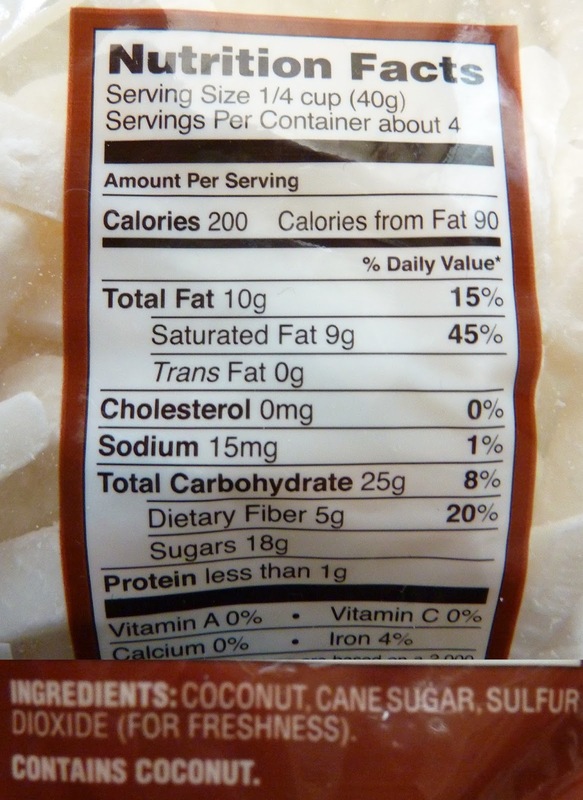 In summary, if sweet, firm, French fry-shaped coconut meat sounds tasty to you, check these out. Here's a little run-and-gun video review so you can see the product up close. Not sure why we even did one for this, other than it was an excuse to capture the beautiful snow, or maybe that "video whiz" comment from Russ went straight to my head—although I'm pretty sure the Shelly fam would do at least as well on camera as we do. 4.5 stars from Sonia. 3.5 stars from me. Look, up on your lunch plate! 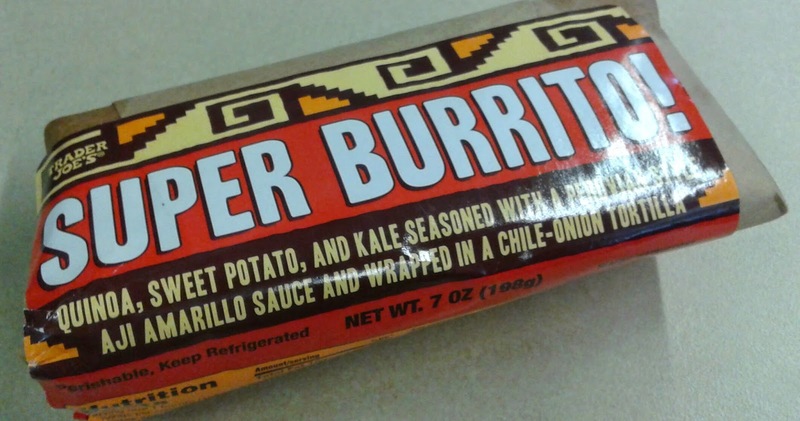 It's a roll...it's a wrap...it's...Trader Joe's Super Burrito!! Much to my dismay, I've found that consumption of said Super Burrito! results in no extra super powers. No leaping tall buildings. No flight or X-ray vision. Heck, for some reason I even ate one of these for a late breakfast, and still fumbled around with basic word pronunciation, sentence structure and pronoun usage until the caffeine from my coffee finally decided to kick in. That's what I'm like when tired, even more than I usually am, which is saying something. There's a reason that Nathan's the video whiz and not me. Kicking it back to the burrito, or as I like to say, "little donkey." Sounds funnier. 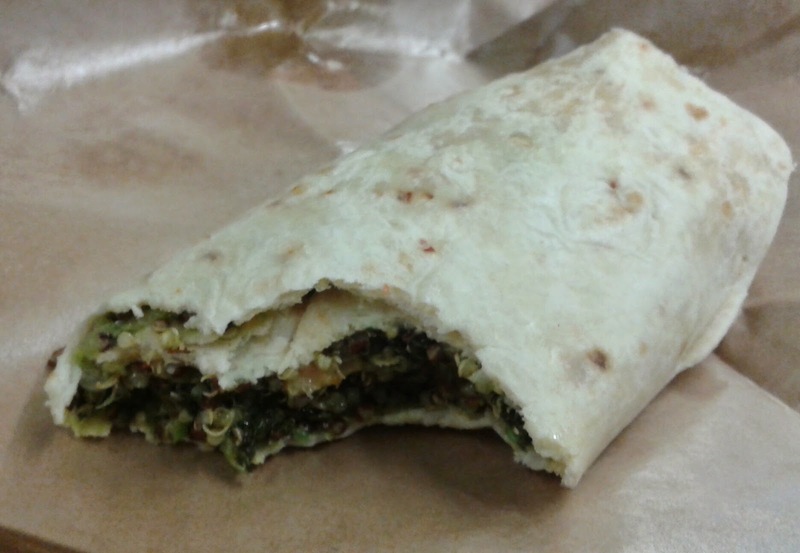 Anyways, this particular wrap is "Super" with an exclamation point probably because of three of the key ingredients: quinoa, sweet potato, and kale. Pretty much any respectable short list of so-called "superfoods" would have at least two if not all three of these listed - all those nutrients and vitamins and other stuff I should probably care more about one of these days. Is the taste "super" though? Eh. It's not bad, but the highlight for me at least is absolutely the chile-onion tortilla. It's just like those ones I can always find at the Ohio stores but never here in Pittsburgh - seriously, PA, let's get better tortillas, beer and booze here, please! The bulk of the innards is composed mainly of the quinoa and micro-chopped kale kinda bathing in this "Peruvian style aji amarillo" sauce, with a couple bitty chunks of firm sweet potato here and there. There's not nearly enough sweet potato for my taste here. The quinoa tastes like, well, quinoa and the kale tastes like it's green. This Peruvian-style sauce, though? Hate to say it, but kinda disappointing. There's literally nothing memorable or distinguishing about it. From what I hear, it's supposed to be "spicy" and versatile", and there's a pretty significant chance I had some when I went to Peru twelve years ago - most of the sauces I can recall were spicy and flavorful and just absolutely amazing. This glop...well, it kinda tastes slightly like mayonnaise, and not much else. There's a bit of lingering heat, but its source is debatable - the sauce or the tortilla? Also, the sauce tends to get a little leaky giving the tortilla and packaging a greasy sheen. Meh. Also...I scanned the ingredients multiple times, and maybe I'm completely missing something obvious here, but I cannot figure out why this isn't considered vegan or at least vegetarian. There's mayo, but it states it is vegan. 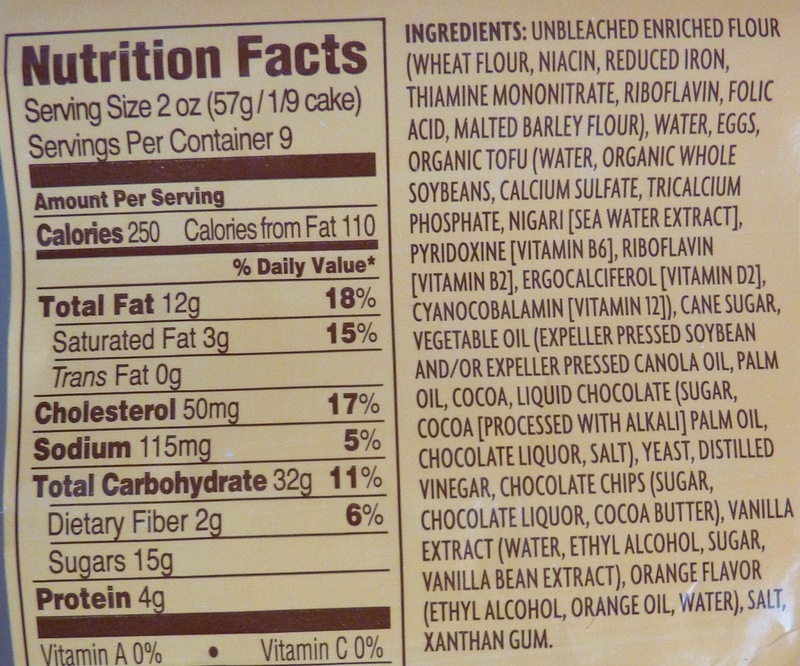 No cholesterol, suggesting lack of animal products...can someone help me out here? I'm pretty sure this cost right around $3.29, and is in the fresh section - not frozen. Can be heated up in the oven or microwave if so inclined. I did neither and just ate them cold at work - no oven (no time for one anyways) and our microwaves there tend to ruin stuff more than enhance them. It may be a little on the small side at first glance, but one of these fueled me for several hours without too much tummy rumbles, so it's fairly filling. "Super" is an overstatement, but a lot catchier than "adequate", I suppose. Most of the time when I see this item on social media, it's accompanied by some disclaimer along the lines of "I'm from the West Coast, so I've never heard of babka," or "I'm from the South, so I don't know what babka is." 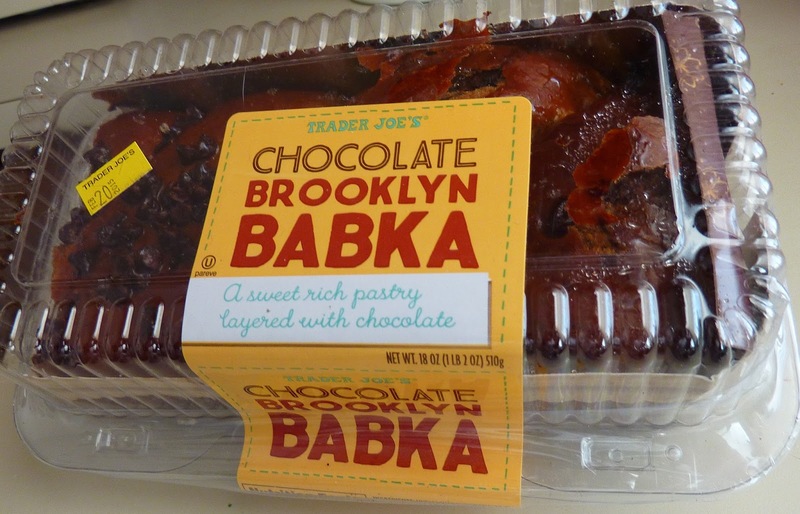 Well, I've lived most of my life in the Northeast and taken many trips to NYC, and although I've heard of babka, I've never actually had it—from Brooklyn or anywhere else. So this will be another fine example of my foodie-hackery at work. I've had plenty of opportunities to sample it during my time in the Big Apple, but it has always taken a back seat to pizza from Lombardi's, soft pretzels from street vendors, hot dogs from Nathan's, cannolis from Little Italy, pudding from Rice to Riches, or dim sum from Chinatown. Next time I'm there, I'll be sure to check it out. But here are my first impressions (Brooklynites, feel free to chime in and correct my assumptions via the comments section below). This thing is heavy. And chocolatey. And rich. It's another Jewish-American treat that arrived in the states by way of European immigrants—and Trader Joe's is making it accessible to the masses. It's a $5 item here in South Jersey, but it's worth it in terms of size, density, and servings (there are 9 in the loaf). There's something brownie-esque about both the taste and texture, although it's more bread-like than a brownie, and taste-wise, slightly more complex. 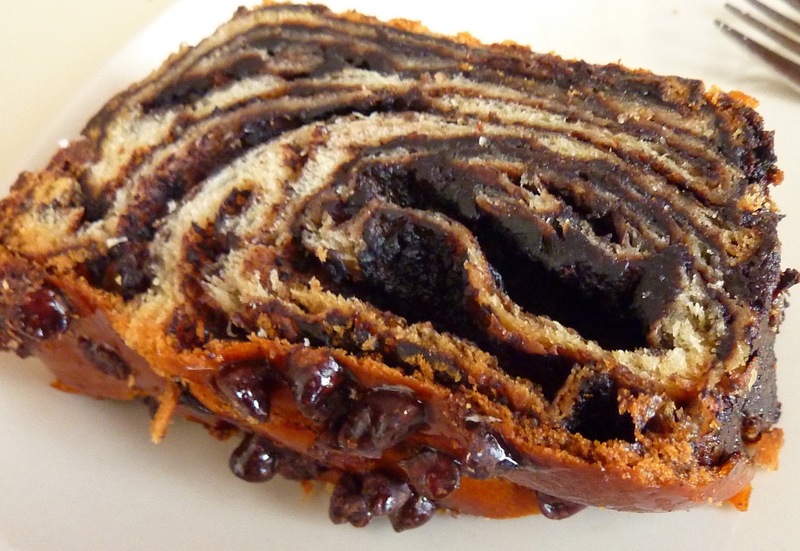 It's like marble rye bread infused with brownie batter, layers of cocoa, and chocolate chips. Parts of the bread seem stiff (in a good way) but there's also a good bit of moisture, both in the "cake" part and on top, where there's a layer of chips and sweet, syrupy chocolatiness. It's almost too chocolately, if there is such a thing. Surprisingly, there are both organic soybeans and organic tofu in the ingredients, along with a few other surprises, although, I assure you—you can't taste much of anything other than chocolate, chocolate, bread, and more chocolate. I suppose that's good for chocoholics. Me? I have to be in the mood for this kind of richness. It's delicious, but at the same time, this pastry could never be more than a once-in-a-great-while treat for me. Have a glass of milk on stand-by when you bite into that first piece. 3.5 stars from me. 3 stars from the wifey. 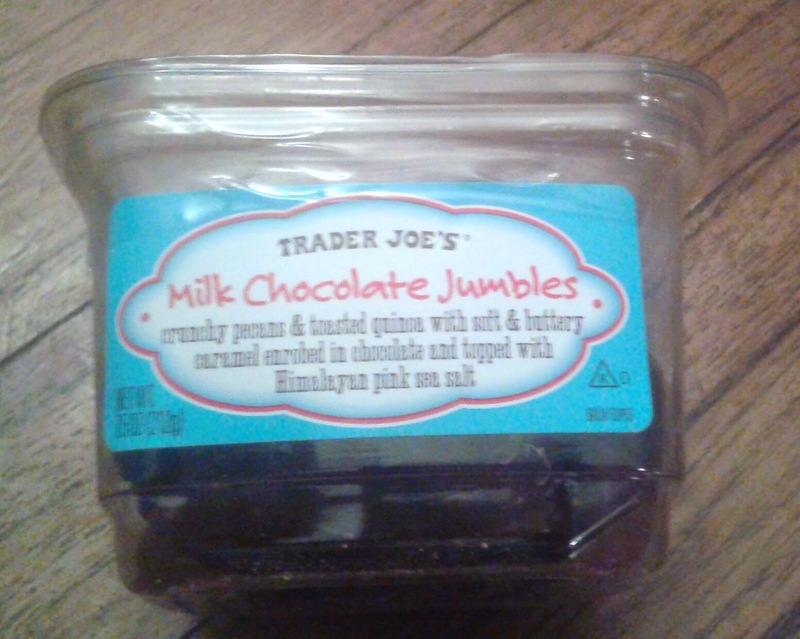 Appropriately enough, my thoughts regarding one of the newer TJ treats out there, Trader Joe's Milk Chocolate Jumbles, are kinda...well...jumbled. Follow along with me here, if I can be coherent enough. Imagine you purchased a pint of ice cream (say, vanilla-based) with milk chocolate swirls, pecans, caramel, toasted quinoa (more on that in a bit), and to really kick up the flavor, some sea salt all swirled in. Sounds delicious, right? You bet. Now, think if while digging thru your bowlful you happened to get a particularly thick, concentrated swirl in a rich vein where all the swirled-in flavors converged in one particularly tasty nugget of goodness. Taste jackpot? You bet. But that'd be like a once in a pintful experience, at most, and as good as it is, how many rich spoonfuls could you really muster and truly enjoy to the fullest? Isn't there something to be said for an unintentionally perfect surprise morsel that makes the other bites, the random thisses and thats that converge, that make that one bite even more enjoyable, that if it were to be repeated over and over again, somehow becomes less enjoyable? Talking like Law of Diminishing Returns-type stuff here, I guess. Make any sense? Sandy said I did, but she's also been hanging around me for over seven years now, God bless her, so either she's used to me or it's a coping mechanism. Anyways, thanks for listening to me make a mumble grumble about these Jumbles. I don't mean it as a complaint, it's just something I thought about a lot while sampling a few of these the other night. They're just so rich, and so nicely balanced, without any variation from bite to bite, that it's almost like they try too hard to be perfect. Although, I'll say it, they're not. While there is plenty of gritty crispiness from the quinoa (similar in taste to crisped rice but much different texture - gritty is best word I could come up with, it's not meant negatively), the pecans are indiscernible in the crunch or the the taste. I cannot honestly confirm or deny the existence of any nut in this product based solely on my taste test. Other than that, the choco-jumbles are pretty tasty. 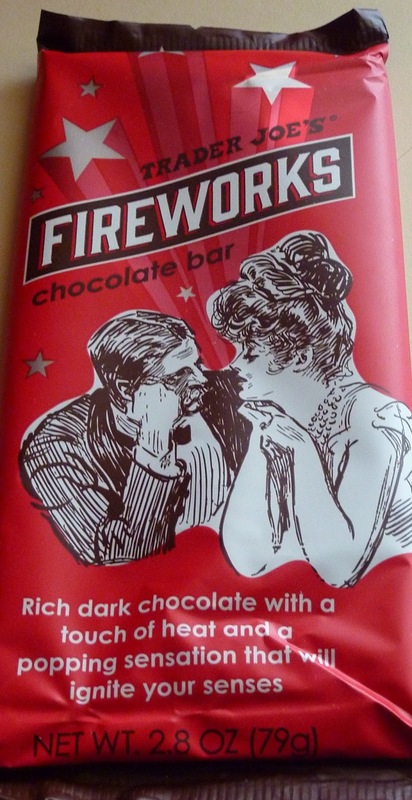 Milk chocolate was the right choice here - although I generally prefer darker chocolate, it would have been too much. The caramel is rich and soft and creamy, and the quinoa adds just the right textural touch while serving as a bit of an initial intriguing oddity - I'll 'fess up, it's one of the main reasons why I bought them. But quinoa + chocolate = YUMZ. And the seal salt on top? Listen, I'm not a salt snob, I can barely tell Morton's from gourmet, but pink Himalayan sea salt: 1) sounds exotic-y and 2) taste right at home on top these candies. Take me to the heights of tastiness, salt sherpa. 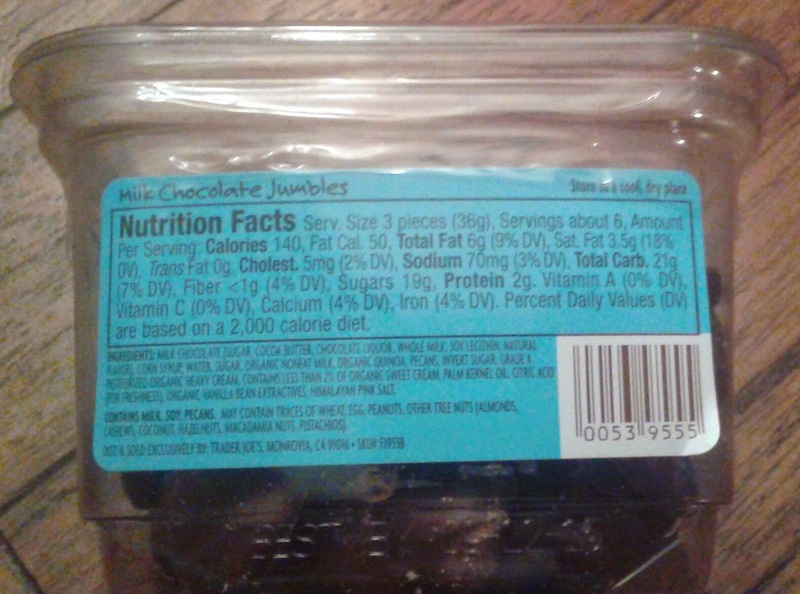 They do seem to quite quite rich after the second - a serving size is three and that took some convincing for me to have that many, and these are good enough that I know (my lack of) willpower is not the main issue. Goes back to that ice cream thing I talked about above. Anyways, they're worth a shot overall. Sandy and I both hover around a 3.5 and 4 for them, so we're gonna call it one of each. Trader Joe's is in the business of selling exotic caramels. And we're in the business of reviewing them. Some time ago, Russ and Sandy checked out the Fleur de Sel Sauce. It's French for "flower of salt." And this Latin American-inspired treat is Spanish for "sweet of milk." Do all foreign caramels have goofy translations? Do the Japanese offer a delectable topping called "All Your Base Are Belong To Us Sauce"? If so, I'd like to try it. FYI, "Pumpkin Caramel Sauce" is 'Murican for "don't feel guilty you just bought a jar of pure sugar because there's a vegetable in the title." This sauce is thick and creamy. Even after warming it in the microwave for 10 or 15 seconds, it maintains its heavy yet smooth consistency. It reminds Sonia of a uniquely-Mexican treat called "cajeta," another foreign word which lends itself to several colorful translations. It's caramelly, sweet, and blends perfectly with vanilla ice cream, similar to TJ's other jars of sauce. Sonia liked this the best of any topping-type confection we've seen from TJ's to date. She gives it a surprisingly high 4.5 stars. I don't think it's head and shoulders above any of the other caramel products we've sampled, but I certainly didn't mind eating it, and I can tell it's a quality product. 3.5 stars from me. 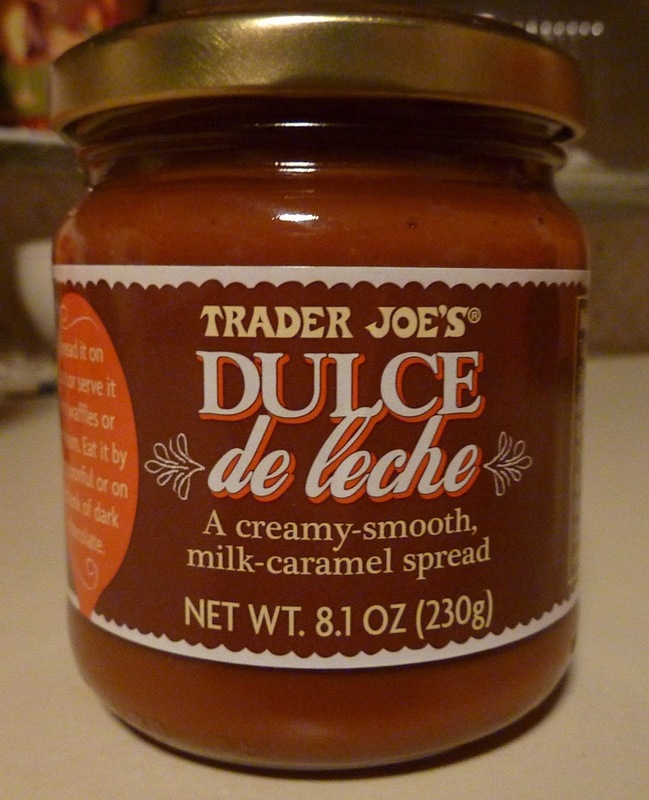 If you're into thick, creamy caramel, you can't go wrong with this stuff. Click here and here for more pics of the product. Oh, there's those magical words again: "Thai" and "shrimp." 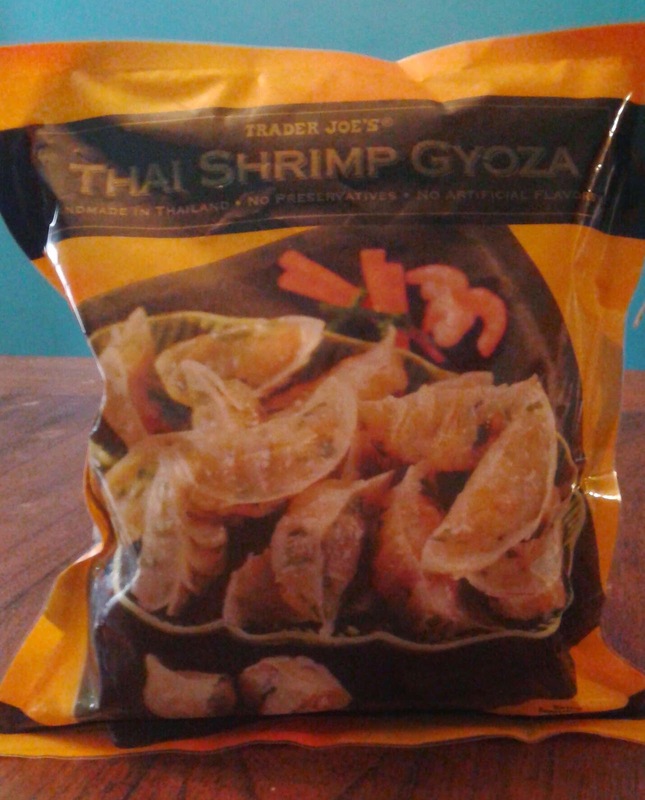 What wonderful, wonderful words, especially when joined together, such as here with Trader Joe's Thai Shrimp Gyoza. Shrimp is almost certainly my favorite seafood, and Thai food...man. When I first discovered Thai food, with the ranges of flavors from complex spice layers to sweet, coconutty curries, I couldn't eat Chinese food for about a year afterwards, because I found it to be so lacking in comparison. And I love Chinese food. Being a fan of Trader Joe's other frozen wontons and similar items, both Sandy and I couldn't wait to try out these gyoza, a new item for us out here in the 'burgh. Can't lie: They're disappointing. I wish it weren't the case, but we swear to tell the truth here, and truth is this: They don't taste like anything special at all. 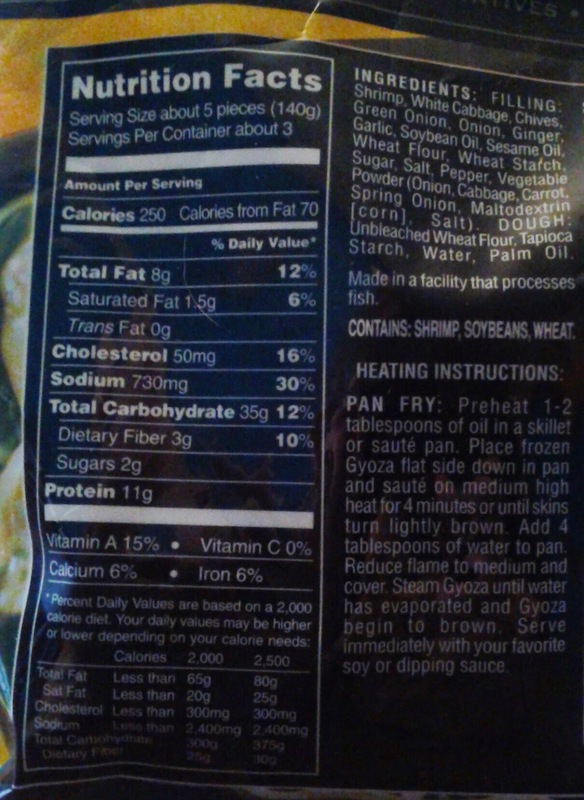 Well, the shrimp itself is good, in that typically fresh, not salty or gritty way that TJ's shrimp almost always is, but other than that? There's nothing that sets these apart in any discernible way, shape or form. There's no sweet and no heat at all. It's just a straightforward shrimp dumpling, which to my fairly uneducated 'merican palate doesn't register as "Thai" one bit. There's no complexity or subtlety, no nothing, heck, not even a splash of fish sauce - just shrimp filling "flavored" by some pretty run-of-the-mill spices and wrapped in dough. If anything, I tasted a little garlic. Granted, they're not horrible, either. There's something to be said for greasy comfort food, which the shrimp gyoza definitely had that sense about them. It's just...we expected more. I really can't think of anything terribly interesting to say here, just because these are pretty mundane munchies. Sandy and I had them for a weekend lunch after M finally passed out for an afternoon nap, and while these may make their way into our cart once more someday, we're not going to go out of our way to ensure that, either. Maybe we're just spoiled by other TJ's shrimp goodies or our own Thai food experiences that when these prawn-esque potstickers offered a pretty mellow, stripped down approach, the two of us just have to be a little bummed. I don't recall the exact price, but I think it was somewhere in the $3.50 to $4 range, so at least it wasn't a huge setback for a little letdown. Sandy's going to call them a 3, which she sees as a perfectly middle score, while I'm going with 2.5 myself. Middlin' score for a meh meal. Sounds just about right to us. And boy are we glad we did. Just for the novelty factor alone, this $2 candy bar is worth a purchase. Guys, I'm telling you, get your sweetheart one for V-Day. It's unique, spicy, and hot, just like your little ladyfriend. It's full of crackling pop-rocks-type candy and cayenne pepper. The dark chocolate is pretty standard other than that, but it blends so seamlessly with the weirdness of the crackling and the spices that it's still a must-try in our books. The "pop-rocks" don't really taste like candy, they just provide a popping, crackling sensation. They sound and feel like mini-fireworks in your mouth. The "attack" of the bar is heavy on the popping, yet the "finish" is when you feel the heat. It's an experience that's hard to describe in words—one that's sure to evoke some "Oohs!" and "Aahs!" I won't prattle on too much about it since Sonia and I took the opportunity to bust out another video review. But I'll give you our final scores: 4 stars from me. 4.5 from Sonia. The taste is definitely better than most dark chocolate, in my opinion, primarily because of the cayenne pepper—but the base is still dark chocolate, to be sure. The epitome of a First World Problem: Here I am, standing in my usual Trader Joe's on a snowy but busy Thursday morning before work. My desk drawer stash is completely barren, and I need me some vittles to make through another crushingly busy day...and my usual go-to goodies are gone. Out. No mas. Something about the truck being held up in the snowy storms that are common enough this time of the year. A crew member says they're busy unstocking but who knows, could be a while. And I don't have time to wait. 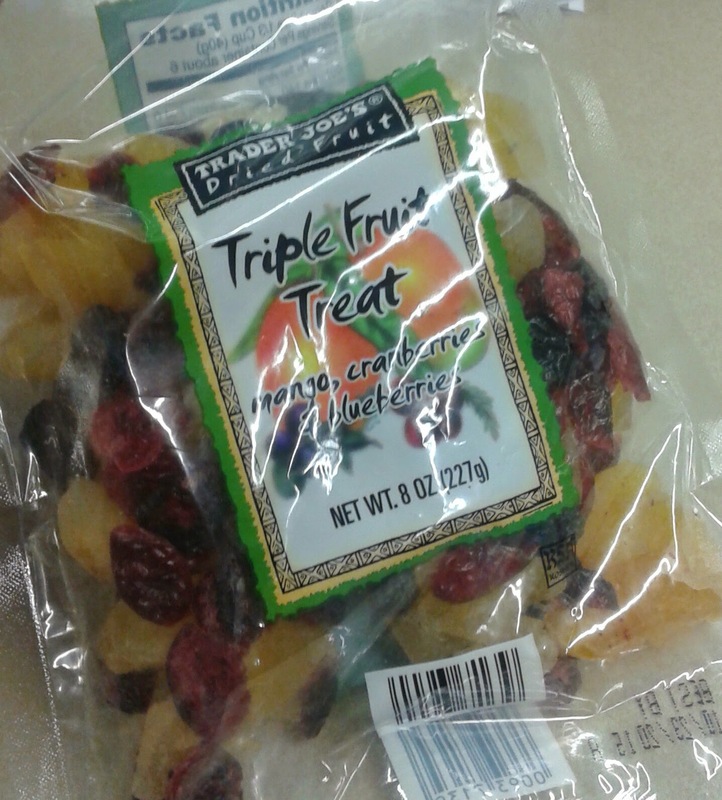 "Hmm, Triple Fruit Treat," I say to myself, not reading any further, as you'll see here in just a second. "Looks like pineapple, cranberry and blueberry. That's an interesting mix, and just $3.49. Let's do it." My complete failure to read and/or lack of basic comprehension has foiled me in the past. This time is another example. First, obviously, not pineapple. it's mango. But that's okay, I like mango. If it's actually, you know, a mango, or at least reminiscent of one. But it's not, and neither are the the cranberries all that cranberry-y or blueberries blueberry-y. 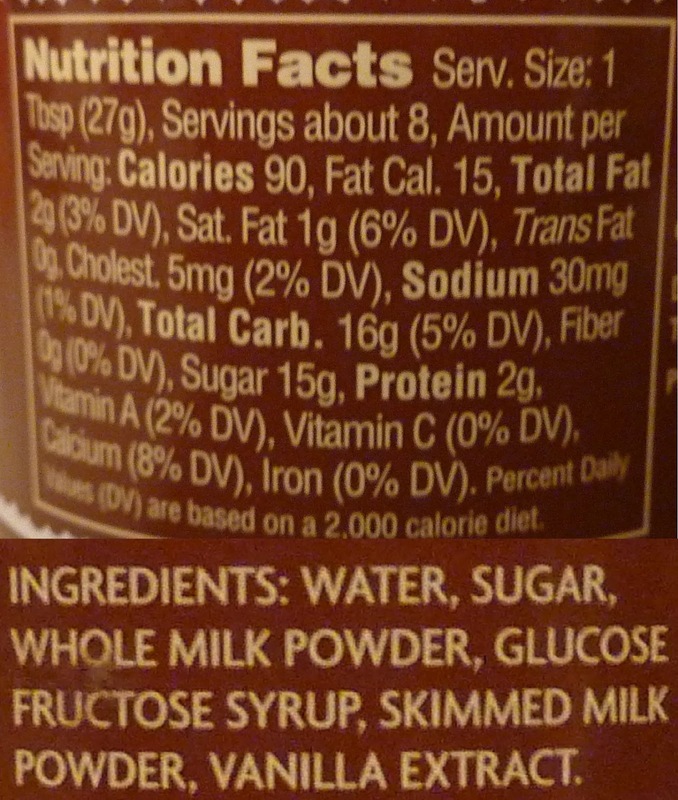 That's because (and obviously, if I failed to read the front, then the ingredients list was skipped) look at all the added junk - oils and sugars and whatnot. Ugh. It's these kind of additives and extras that take a perfectly glorious piece of fruit, one of the wonders of creation, and make it a chewy, waxy, falsely sweet lump of Frankenfruit. And that's pretty much how this tastes. It's like I chopped up some wax fruit from your Aunt Betty's coffee table and tried to ingest it. Ugh. The "mango" tastes nothing like mango, and I could only tell the blueberries and cranberries apart because of the color difference - it all just blends together in a mass produced blend o' blandness. I took a couple small handfuls hoping the experience would get better, and honestly it just left me a sticky gross sweetness in my mouth, a weird buzz in my tummy, and desperation in my soul. Yuck. How bad is this stuff? The following day, I came into work at 9:30 a.m., didn't leave until nearly 11 p.m. that night, and epically failed to either pack a lunch OR dinner after a meager breakfast, felt too cheap to go buy something, had these at my desk all day long...and couldn't muster up the guts to have more than a small begrudging handful. Thank goodness someone left a bag of crispy delivery lo mein noodles I claimed as mine when 9:30 p.m. rolled around. They're so bad I'm not subjecting my wife to them, and they are a strong candidate for a TJ's return (done only once for taste-related reasons). Big Joe, as a suggestion, instead of calling these "Fruit Treats", call them "Froot Treets" to more easily tip off the oblivious shopper (namely, me) as to what they're buying, basically this ain't anything close to the goodness of actual dried fruit. I should have taken the hint that after a wintery blast, and with more snow on the way, there were still abundant bags of this garbage left.